The pen is mightier than the sword is not only a cliché but a truism. It is not bombs that will decide the fate of Western Civilization but words. Words like those found in The Muslim 100; words like those found in Pain, Pleasure and Prejudice. 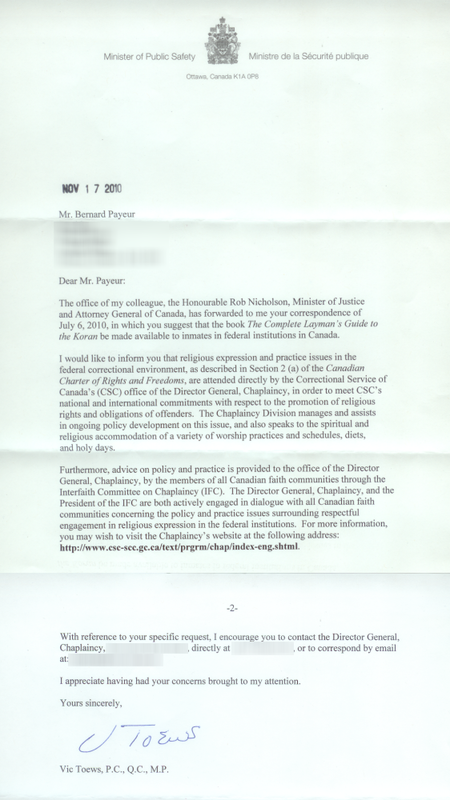 In this battle of words, in a letter I asked the Honourable Robert Nicholson, Minister of Justice and Attorney General of Canada to make Pain, Pleasure and Prejudice available to guests of Her Majesty’s prisons e.g. prison library. The Prison Officers’ Association is worried about this “upward trend” in conversion to Islam in British Prisons, and so they should be. The conversions may also be a factor of the way Islam is taught in U.K. prisons (and I suspect in Western prisons around the world”) which is bound to make many of these “convenience Muslims” into permanent committed believers. I am presently reading a well-written, deceptively amateurish, powerful, convincing argument to convert to Islam by an Imam to Her Majesty’s Prison Service. The fact that it is an extremely biased, highly selective, misleading and sanitized argument is beside the point. If you don’t know any better it is a compelling argument to become and remain a Muslim. I suspect a similar argument is being made to non-Muslims in federal prisons in Canada. Pain, Pleasure and Prejudice, The Complete Layman’s Guide to the Koran (excerpt attached, more at boreal.ca) from Boreal Books® offers a much more balanced perspective on the Koran (Qur’an) and the life and times of the Prophet Muhammad than does the seductive The Muslim 100*. We understand the risk in making our Layman’s Guide to the Koran available to the general prison population, but it is a risk we are willing to take. Information, accurate information about the Koran and the man the believers reverently refer to as “the perfect human being” is what will decide our future and right now we have too much of the other kind. * The Muslim 100 – The Lives, Thoughts and Achievements of the Most Influential Muslims in History by Muhammad Mojlum Khan is published by Kube Publishing’s, Publisher and Distributor of Books on Islam and the Muslim World and is of course available at Chapters. The matter you raise falls within the purview of the Honourable Vic Toews, Minister of Public Safety. I have therefore taken the liberty of forwarding a copy of your correspondence [to the Honourable Rob Nicholson] to Minister Toews for his information and consideration. c.c. The Honourable Vic Toews, P.C., Q.C., M.P. Following is the Minister of Public Safety's reply which may give you another indication why we are losing this War of Words. As to the Minister’s suggestion that I contact the Directory General, Chaplaincy, Correctional Service of Canada; Pain, Pleasure and Prejudice is not a book of religious instructions, as I am sure whoever drafted the Minister’s reply is well aware, but a book about a religion, a religion that government officials and their masters are afraid to even approach within the distance of the proverbial pole. I have to assume that the suggestion is meant as a time-wasting diversion (it was), not only because of a previous experience with trying to get men of God (read Birds of a Feather) interested in Pain, Pleasure and Prejudice, but also because of the letter’s self-congratulatory tone as to how well the spiritual needs of prisoners are looked after in Federal prisons which has, of course, nothing to do with what I proposed. I am fortunate to count the Honourable David Kilgour as a friend. As you may be aware, David travels the world, not only to help those who are at the mercy of oppressive regimes but also to encourage the Faiths to talk about what they have in common and how working together they can make this world a better and safer place for all. I asked David what he thought of my Layman’s Guide to the Koran. He said he had to stop reading it because he did not like where it was going. At the risk of putting words in his mouth, David believes that all mainstream religions have a positive message for humankind on how to get along and on how to live a good, god-fearing life, and when reading revealed scriptures (whether it be the Bible, the Koran, the Guru Granth Sahib...) it is that message we should look for and it is that message we should promote. Pain, Pleasure and Prejudice is a former Catholic’s systematic review of a most exigent faith’s core religious text. This does not mean that I have not attempted to offer a balance perspective – going as far as to acknowledge my own prejudices in the book’s title. Still, I cannot foresee the Chaplaincy making my Layman’s Guide available to the prison population as part of its spiritual mission. Having said that, I believe it has its place on a library shelf, even a prison library – perhaps, especially a prison library. I would like to send you a complimentary copy and invite you to read it and make up your own mind, which is what I invite all my readers to do. I suspect your reaction will be the same as David, for whom I still have the utmost respect, but that you will persevere. After having turned the last page and read the last sentence, I would hope that you will recommend to Correctional Service of Canada that Pain, Pleasure and Prejudice - The Complete Layman’s Guide to the Koran be made available to the general prison population just like any other book on religion.